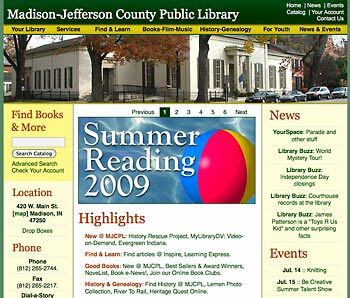 The Madison-Jefferson County Public Library website was held captive in a static HTML site that could only be updated directly on the server. We desperately needed to create a dynamic site that could be edited by multiple staff members from anywhere in the world. I turned to the graceful Textpattern content management system which allowed me to create custom sections for the different departments in our library. 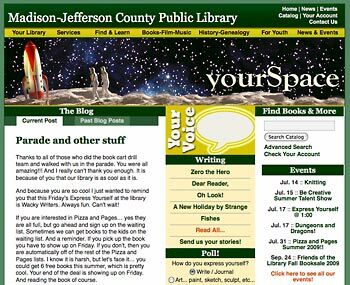 We were able to leverage our new site to create a lively young adult section (below) and one of Indiana’s top digital history collections. The site’s traffic quickly doubled after the redesign and it won ALA conference recognition in the Library Administration and Management Association’s “Best of Show” marketing contest in 2006. The site served the library from 2006 to 2011. Snapshots can be found at Archive.org. MJCPL also had an active young teens program for grades 5-9 and we wanted to create a page that allowed the students to find their voice. In addition to a blog with a lively comment section, the site also highlighted the students’ opinions, writing and reviews. Snapshots can be found at Archive.org. © 2006-2018 Jerry Yarnetsky, MLS. 5179 Riggs Road, Oxford OH 45056. jerry@yarnetsky.net (267) 329-9276.